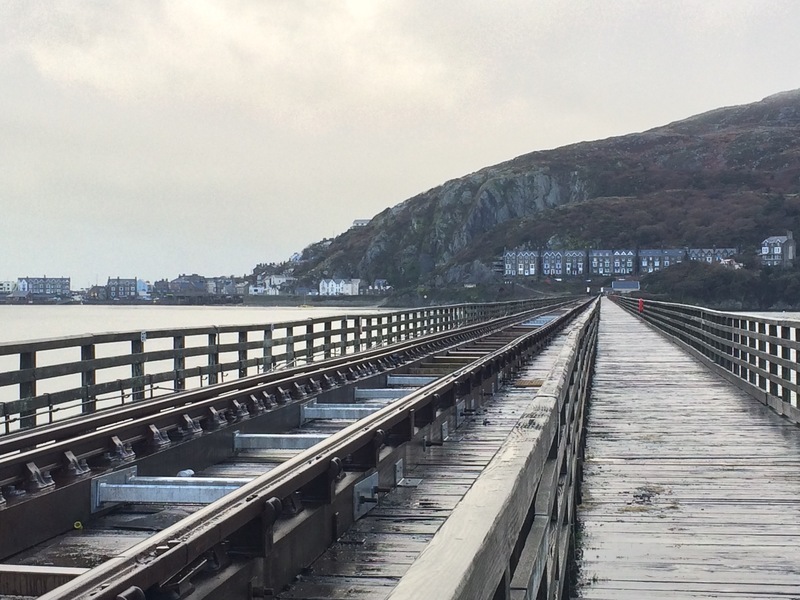 I returned to Barmouth this week and only managed to walk 3 more days before calling it quits for this year. 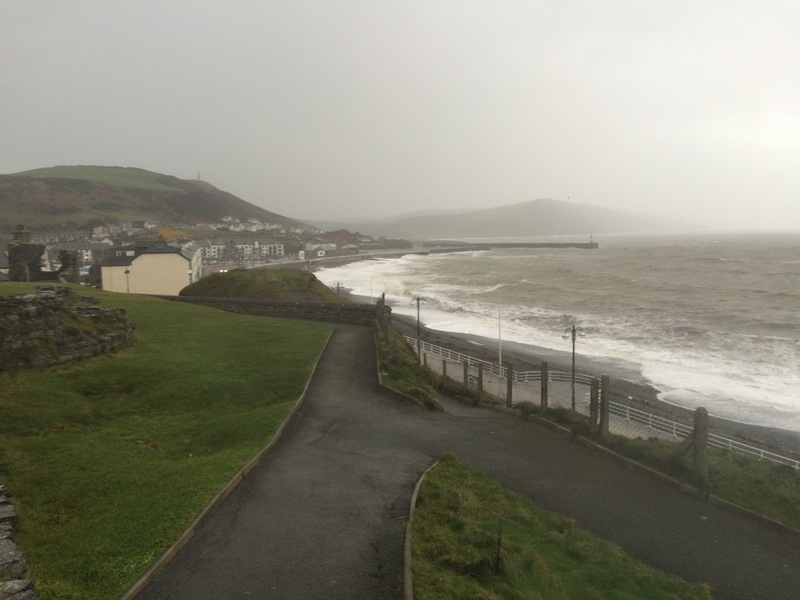 My walk around the enormous Cardigan Bay from North to Mid-Wales has been dominated by poor weather; very strong wind and heavy rain. 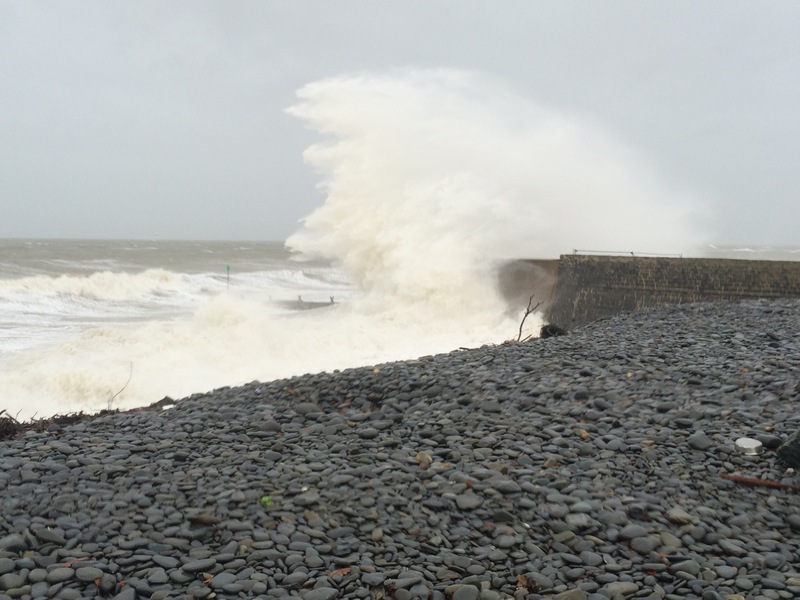 It has been good to experience for myself just how extreme coastal weather can be and I have enjoyed it. However, I would like to be able to experience this area in better weather as well, so I can see the views and the wildlife. Another day of shockingly bad weather. Even Friz said that the wind was “outrageous”. There was no way Greg and I were walking anywhere today! 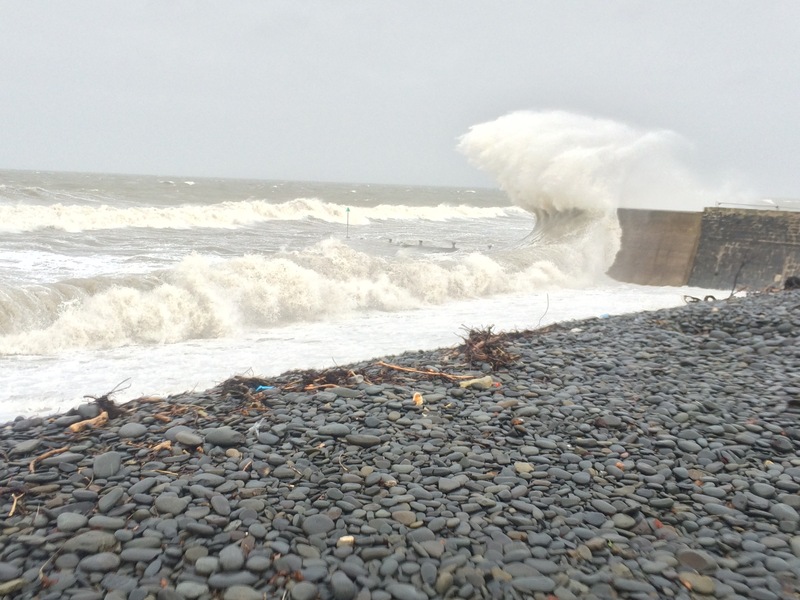 The Aberaeron tide was worryingly high and Friz was rehearsing his role as disaster coordinator in case the harbour wall was breached. 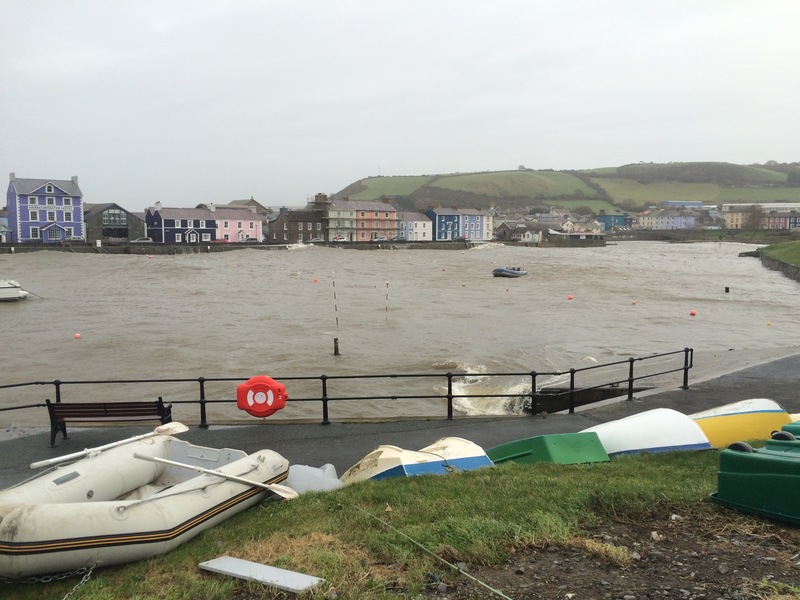 The wind was predicted to be >60 mph and it was blowing the water over the sea wall on the North side of the harbour. I joined a few other people who had come to see the weather in action; sort of ‘weather rubberneckers’. It was body-battering on the shingle beach! Greg had to drive home, right past my front door. It was too good an opportunity to miss and I decided to postpone walking until 2016. Pushing on through the poor weather would mean missing too much scenery and great views so I determined to wait until the weather improves. On the long drive home I had time to contemplate all the chores I needed to do at home and when the weather might improve to a point that I want to restart my walk (might be as late as March 2016 I guess). This is a departure from the original plan but seems like a sensible one so long as I can afford to extend my gap year. 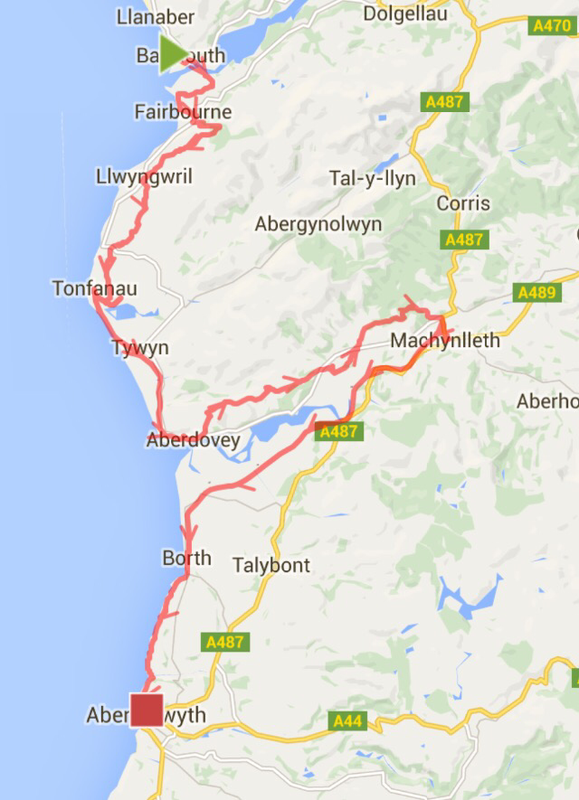 To recap, the new plan is to enjoy being at home and restart walking from Aberystwyth sometime (tbd) in 2016. I had an interrupted night’s sleep in an uncomfortable bed that was separated from the crying baby next door by a paper-thin wall. I felt sorry for the baby’s parents and I wasn’t annoyed; it was just one of those things. 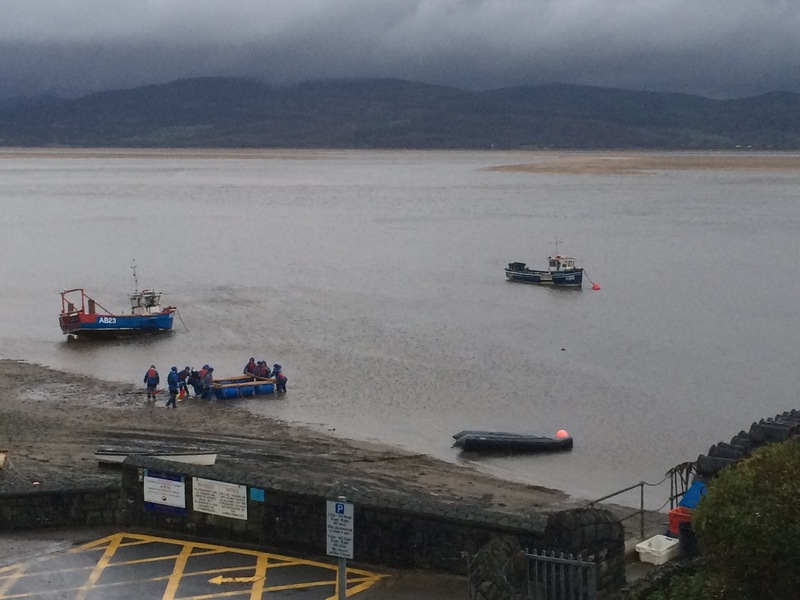 Yesterday the man on the desk in the museum had mentioned that the last few tides had been quite high and today’s high tide was around 9 am. 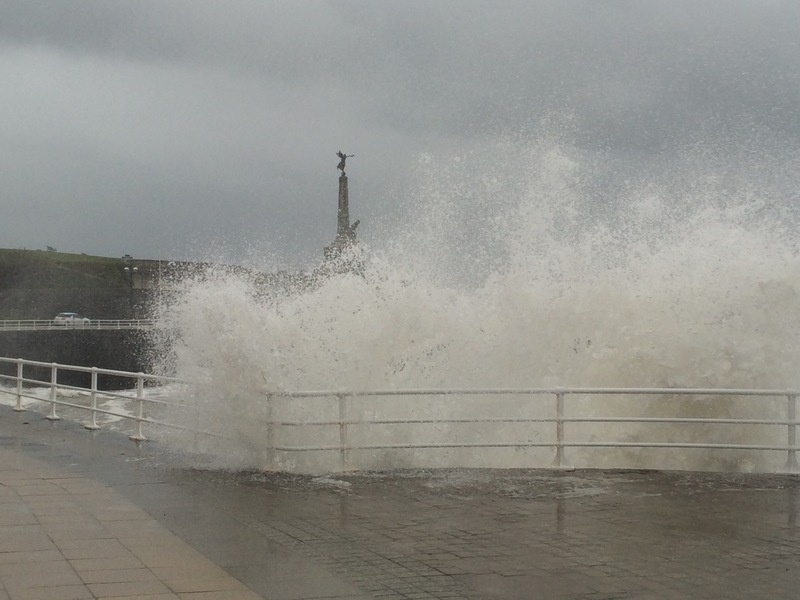 I headed down to the sea front to see if the poor weather and high tide would combine to provide a bit of a show. I wasn’t disappointed. 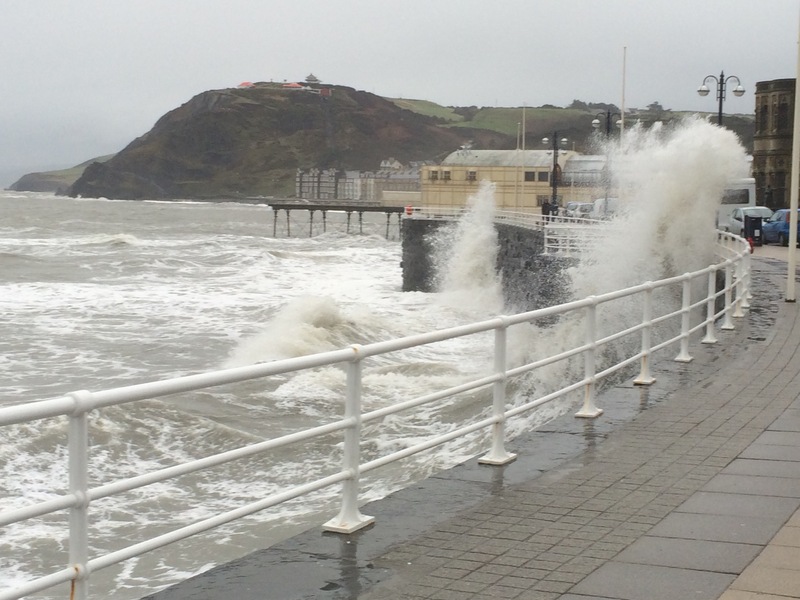 The sea looked rough and was crashing into the sea wall, spray coming onto the promenade. It was fun to watch. 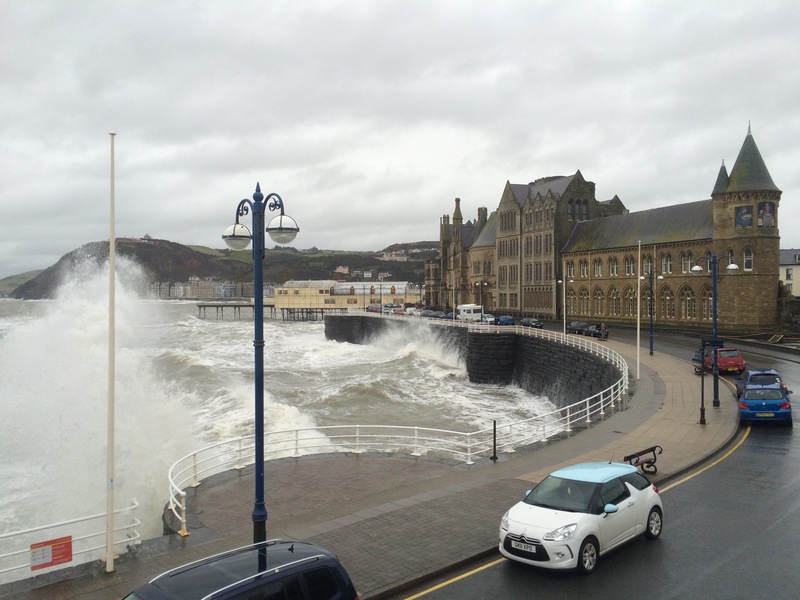 I walked up and down the promenade enjoying watching the tumult that was going on sea-side of the big wall. 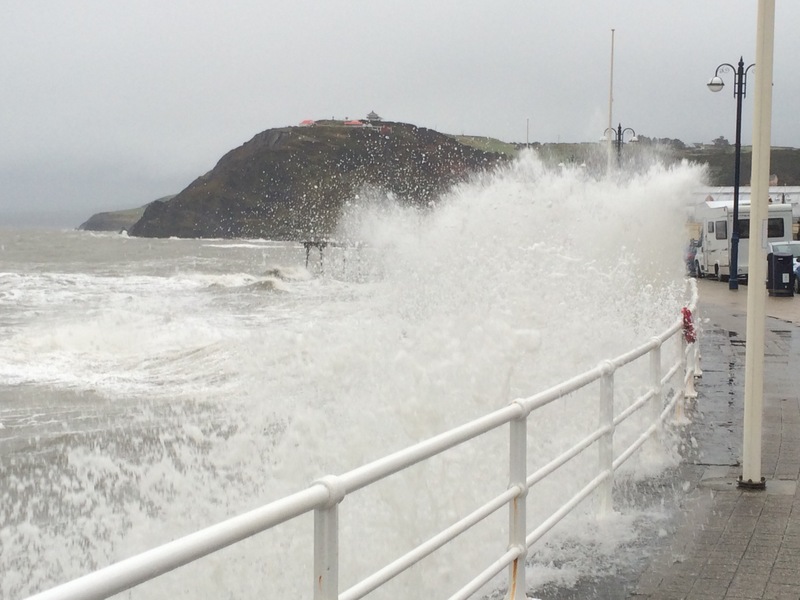 Other people also came to look and a couple got soaked when a wave came over the barrier. The wind was building but not yet too bad; however, the rain was coming in very heavy waves and I was forced to keep dodging in and out of shelter as this rain was no respecter of waterproofs! 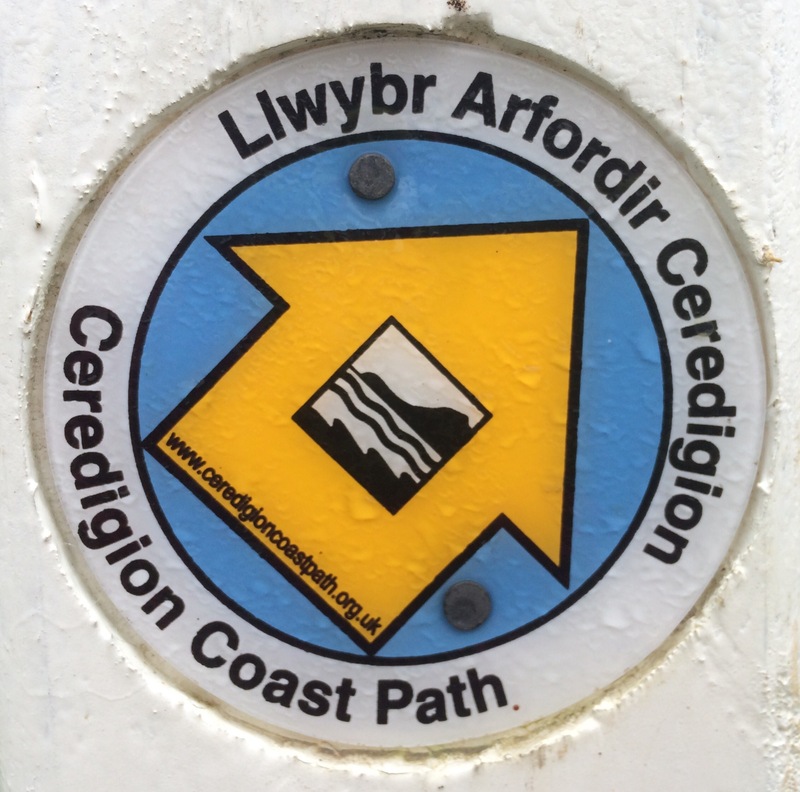 Unfortunately, I was meant to be meeting Greg halfway on today’s walk, staying with his friends in Aberaeron, and then walking together tomorrow. I felt guilty but happy with my decision not to walk. Even more unfortunately, tomorrow’s weather forecast was worse than today’s and so it looked like Greg had driven the 180 or so miles from Oxfordshire and wasn’t going to get the walk he came for. Now I felt really bad, but it still wasn’t a good reason to walk the cliff path. 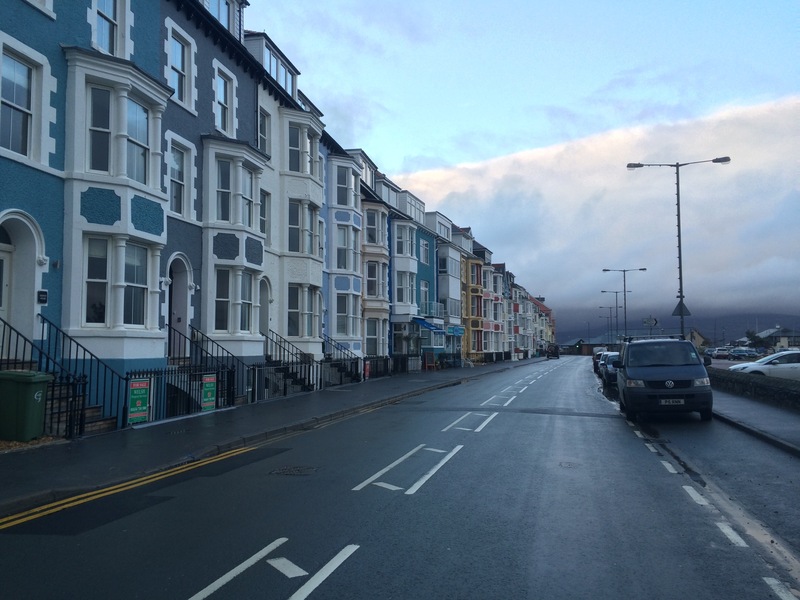 Instead of walking to meet me Greg drove up from Aberaeron and we discussed plans over a coffee in town. 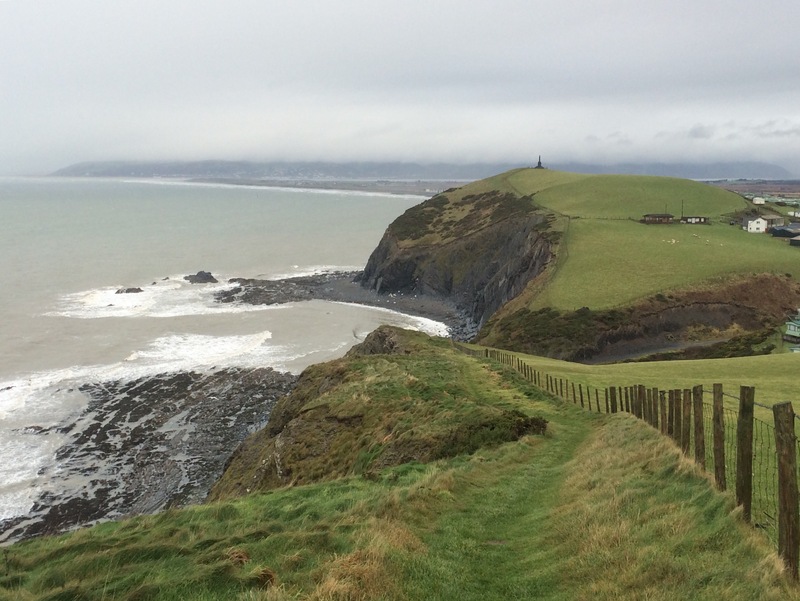 Greg’s host, a keen walker, had advised him against walking the coast path today so we were in agreement. 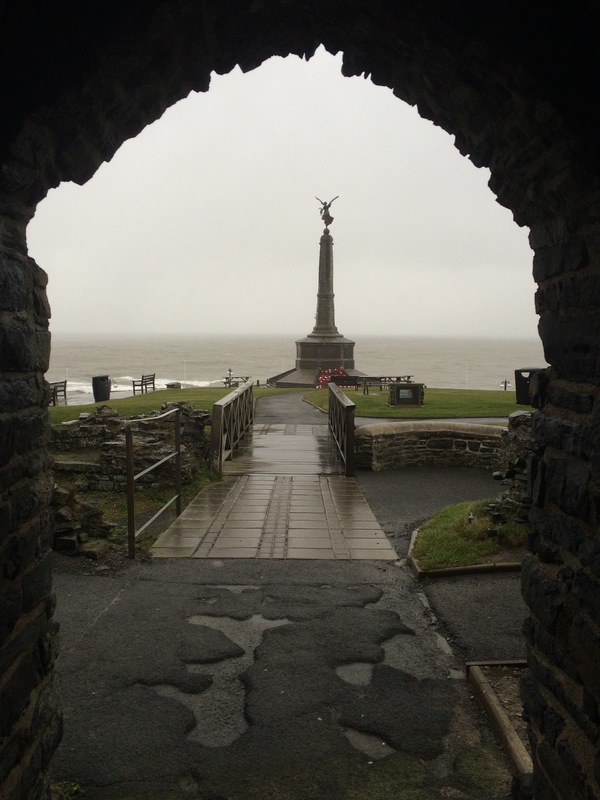 After a coffee we walked to take a quick look at Aberystwyth Castle ruins. Another King Edward I castle. This one was built in 1277, along with its 3 contemporaries at Builth, Flint and Rhuddlan. All part of Edward’s strategy to dominate Llywelyn ap Gruffydd. 1. I avoid walking an exposed coast path in extreme wind conditions. 2. I don’t mind getting wet in the rain but I do prefer not to walk day after day in persistent rain because rain means cloud, cloud means low visibility, and poor visibility means no views. 3. Poor weather generally means little contact with wildlife or people, as both tend to hide. 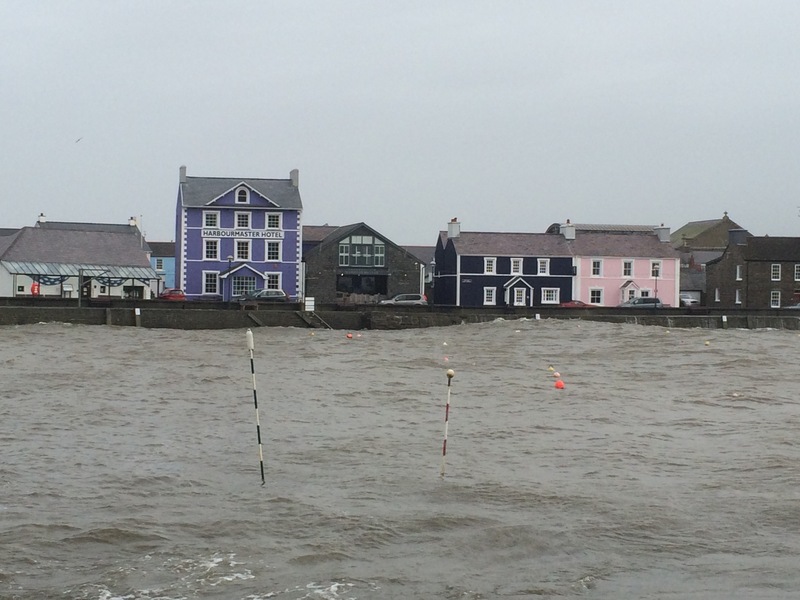 Aberaeron is a beautiful coastal town and I was lucky to be well hosted by Friz and Deb. 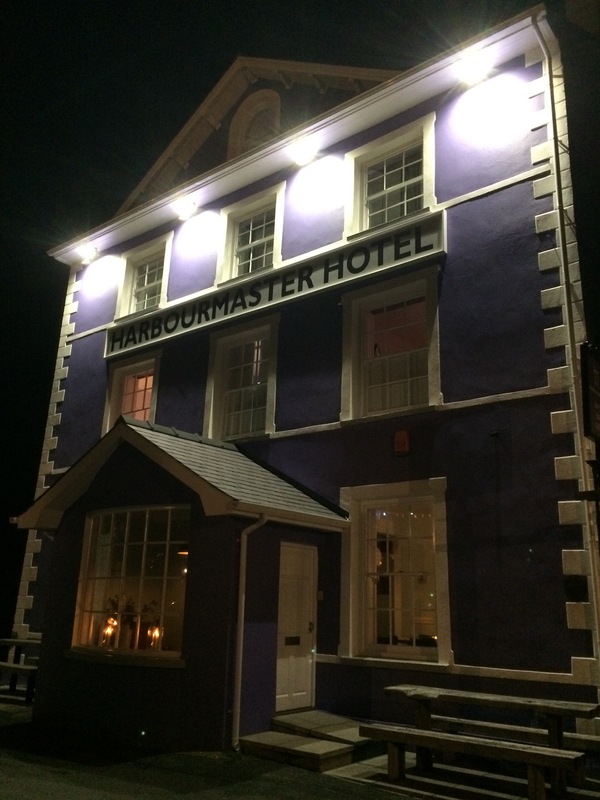 Greg and I went out to the Harbourmaster Hotel for a lovely dinner and I was surprised by how busy the town was. 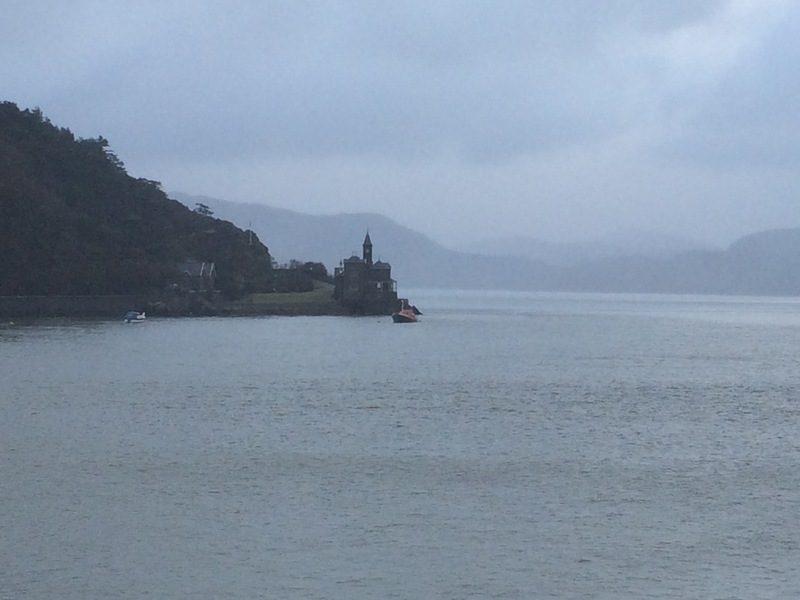 We stood on the top of a small watch tower in the dark and watched the high tide batter the coast. During the night I could hear the wind battering the windows and was glad to be safely tucked up. Rather unsurprisingly it was raining heavily when I emerged from The White Lion. 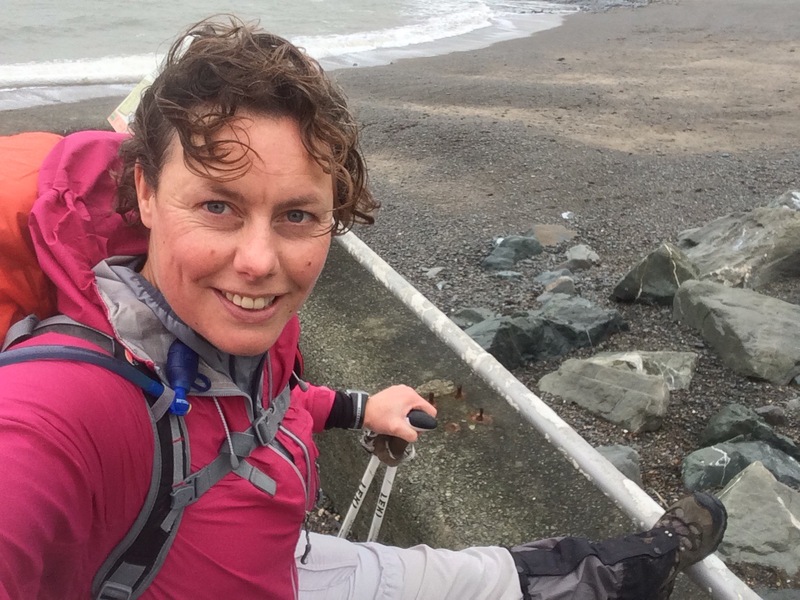 The rain was coming in waves and I had decided not to walk the 15 miles back along the ridge line that separates the hills from the Dovey Valley; I wouldn’t see anything and it would take all day. 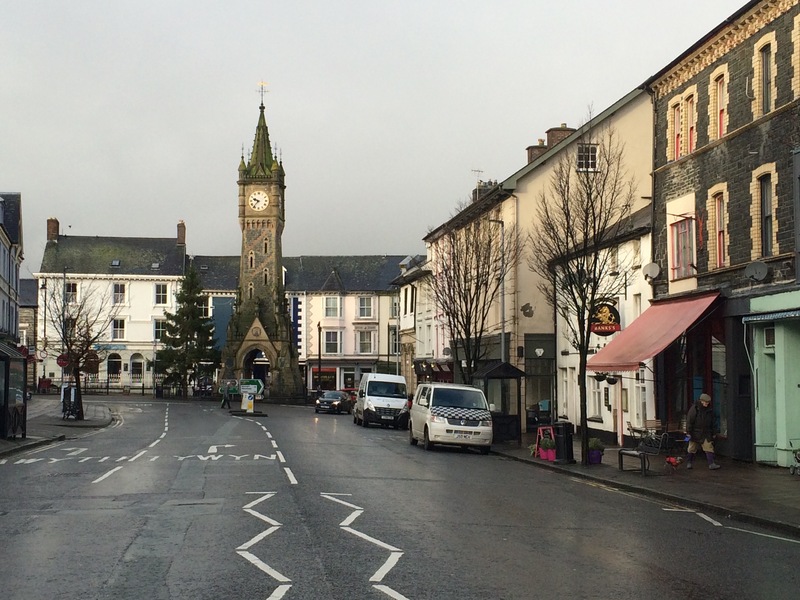 Instead I had time to wander around Machynlleth again before catching the train along the valley to Borth. I managed a quick look around the Parliament House, which is full of meeting rooms, and stopped at one of the bookshops to buy myself a historical Welsh novel. Not far out of Machynlleth the train crossed the border into Ceredigion. 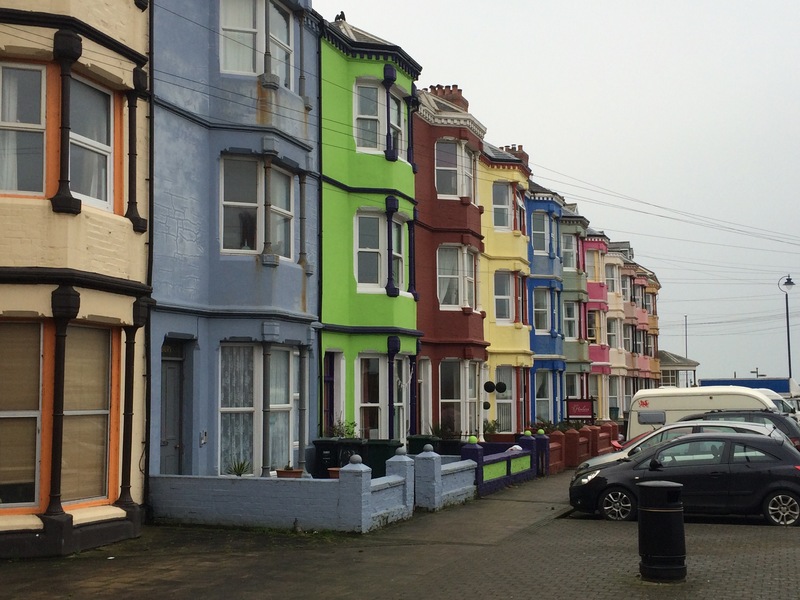 Alighting from the train at Borth I was confronted by the brightest painted street of houses I’ve seen so far. in need of my sunglasses in Borth! 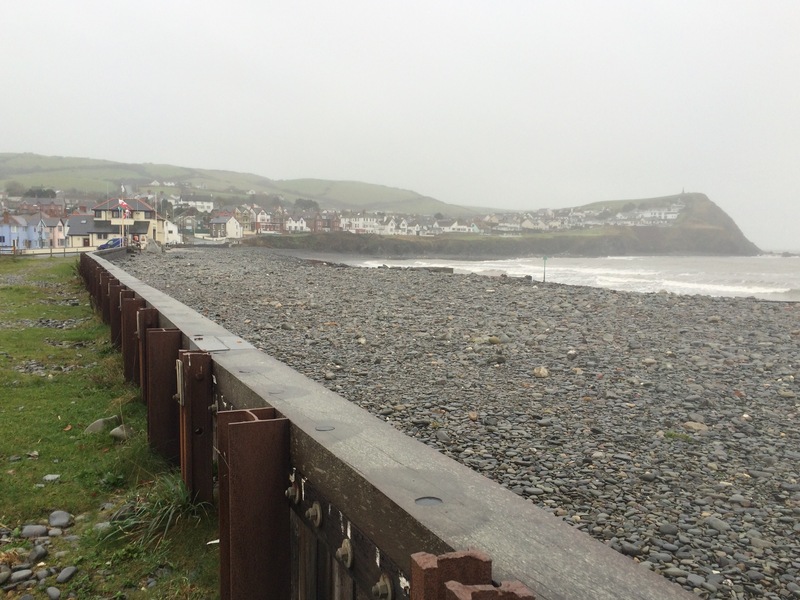 Borth was pretty much one long street next to a shingle beach, merged with Upper Borth on the rising cliff at the end of the beach. Upon leaving the town I was on a beautiful cliff top path following the ups and downs. Waves of heavy rain were interspersed with lighter drizzle and the poor weather seemed to be keeping the wildlife quiet. 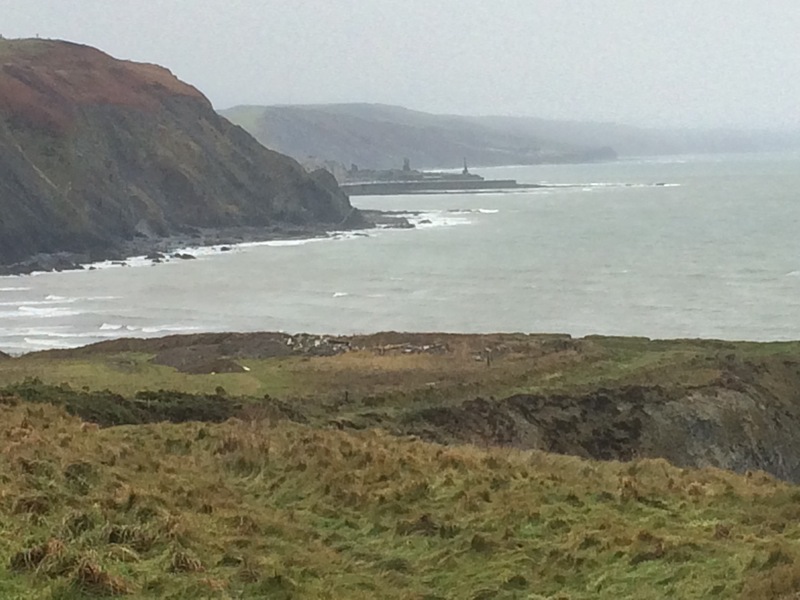 There were some seagulls enjoying riding the updrafts and I was lucky enough to see a pair of Choughs. The path was muddy and slippery but manageable with my walking poles. Yet again they proved their value by keeping me upright. 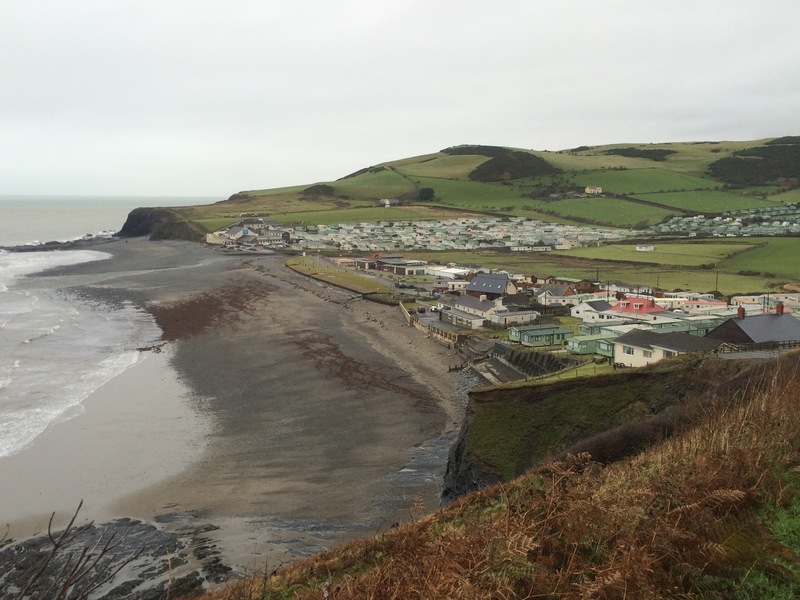 Just North of Aberystwyth is Clarach Bay; apart from a couple of brick houses it’s a village of static caravans next to a lovely beach. 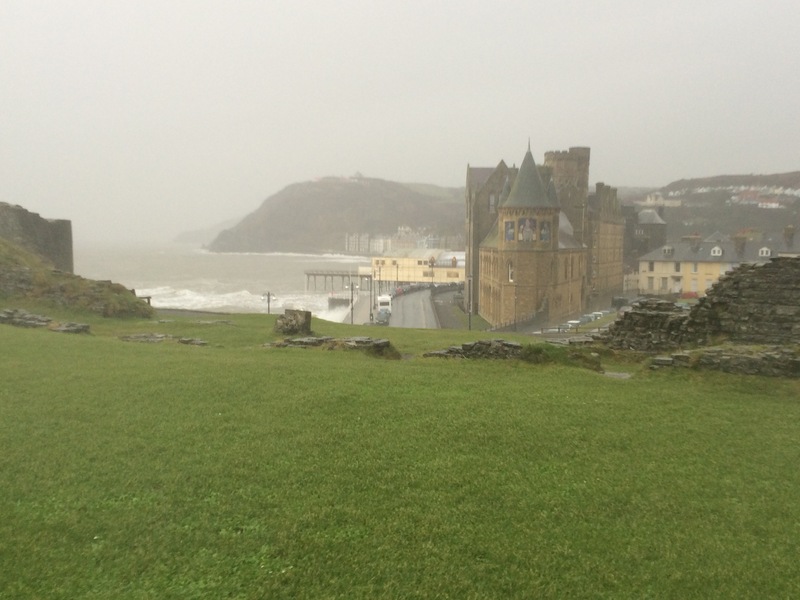 From here I could see Aberystwyth’s Castle ruins and memorial poking out between the cliffs. 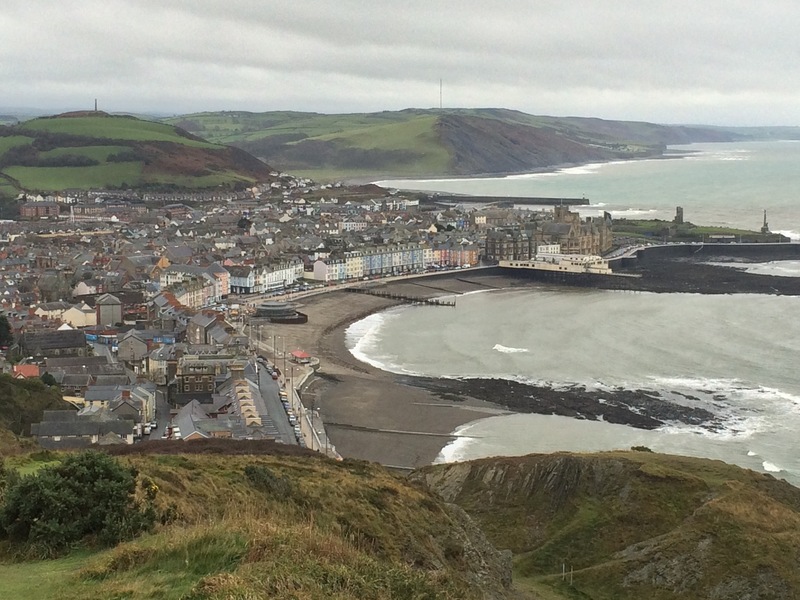 Aberystwyth is bounded by two coastal hills: Constitution Hill to the North and Pendinas Fort to the South. I climbed Constitution Hill, the site of Aberystwyth’s Camera Obscura (which apparently has the largest camera obscura lens in the world). 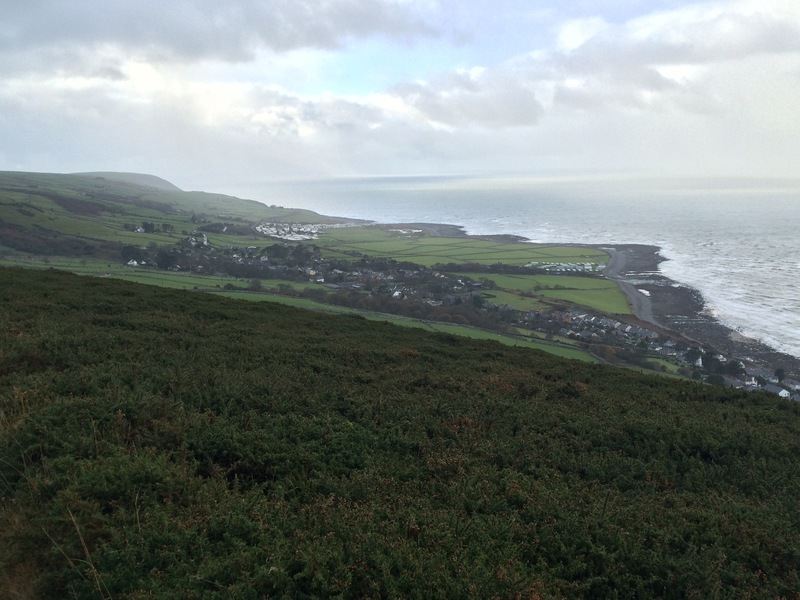 From the top of the hill I was afforded a great view of Aberystwyth on a gloomy, grey day. There are a few grand buildings on the sea front and of course the Castle and memorial. I walked down the steep hill next to the cliff railway (not running today) and found myself at the Northern end of the 1.5 mile long promenade. According to local tradition one should “kick the bar” after walking the length of the promenade. 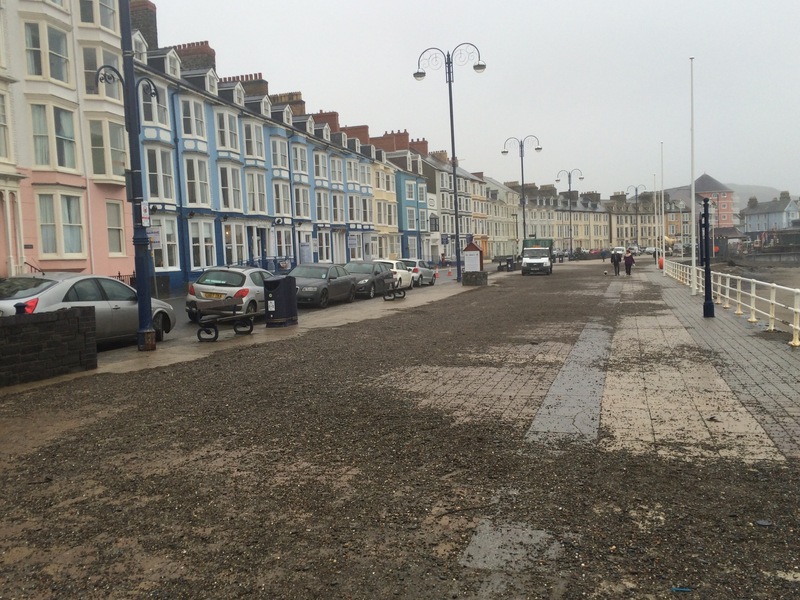 Aberystwyth has been referred to as the ‘Brighton of Wales’ since at least 1797, and it did remind me of Brighton. 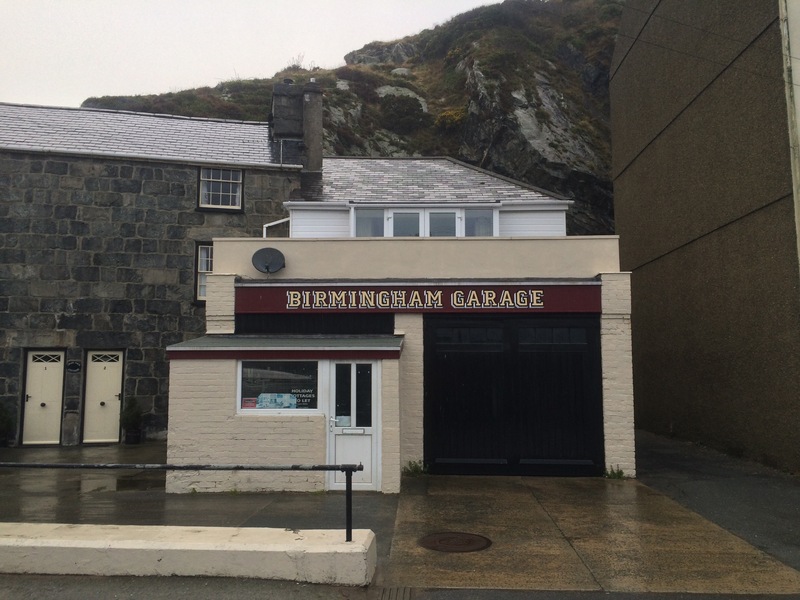 It came to prominence as a mid-Wales seaside resort in the 19th Century with a pleasure garden, assembly rooms, a pavilion, a pier, theatres, concert halls, a cliff railway and even a bathhouse containing heated sea water! 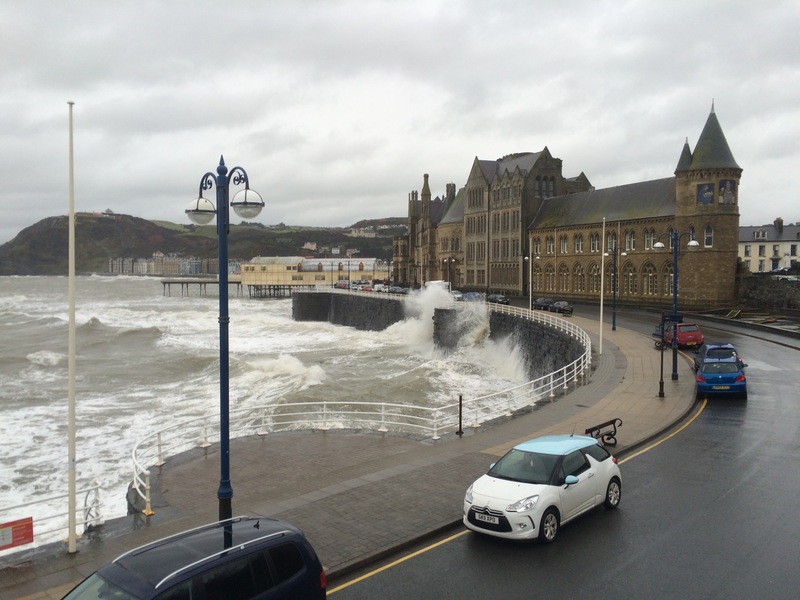 Aberystwyth is also a university town and has a long educational history. 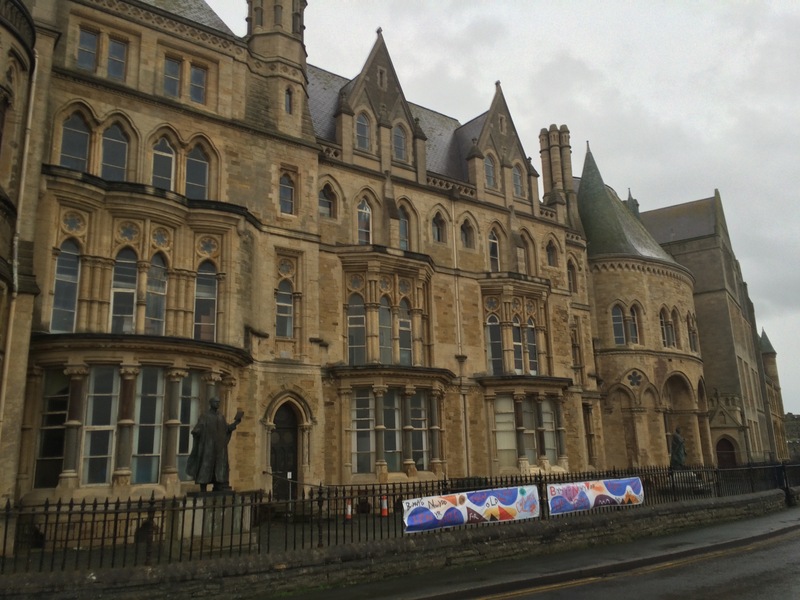 The National University of Wales was opened in the former Castle Hotel in 1872; it had 3 staff and 26 male students. Women were admitted from 1884. 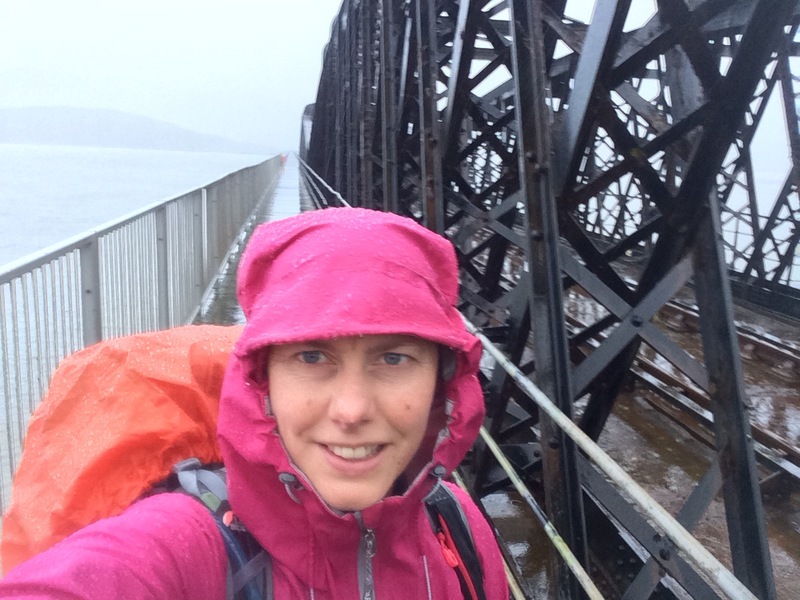 In the pouring rain I checked into my low grade B&B, dumped my rucksack and headed straight out. I spent an hour or so mooching around the Ceredigion Museum. 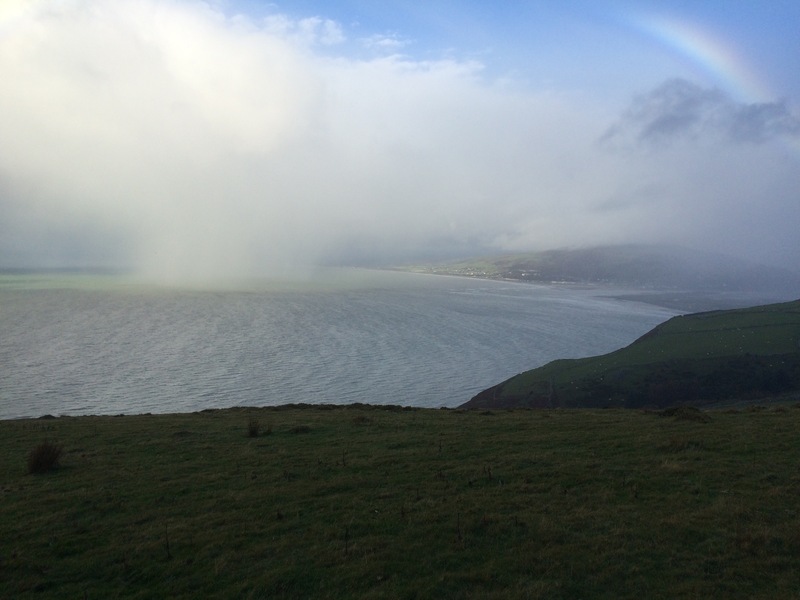 There was an incredible moment when the wind suddenly picked up and swept violently onshore carrying an incredibly heavy burst of rain. It was such a loud and violent act that I headed straight for the nearest window to see what was happening. 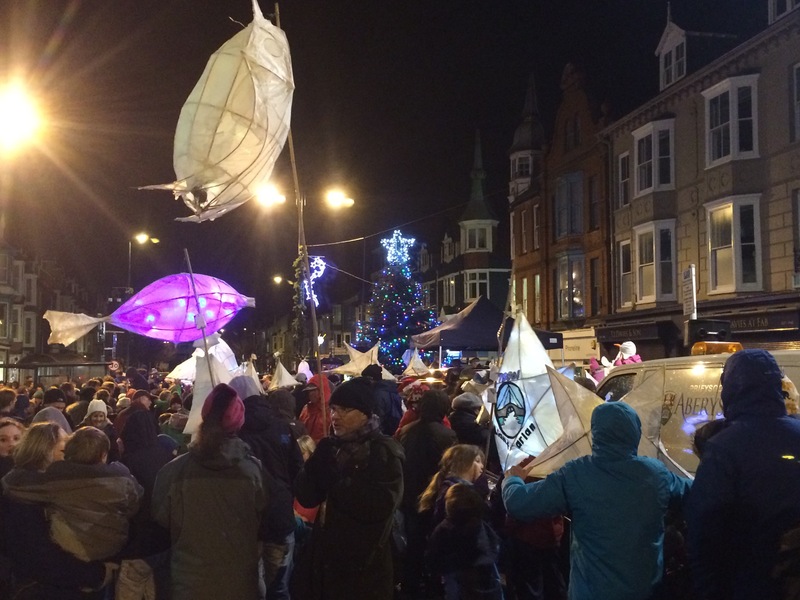 Today was the day of Aberystwyth’s Christmas lights switch-on. And the weather was terrible. I headed into the town centre to watch the festivities and it was a sorry sight. 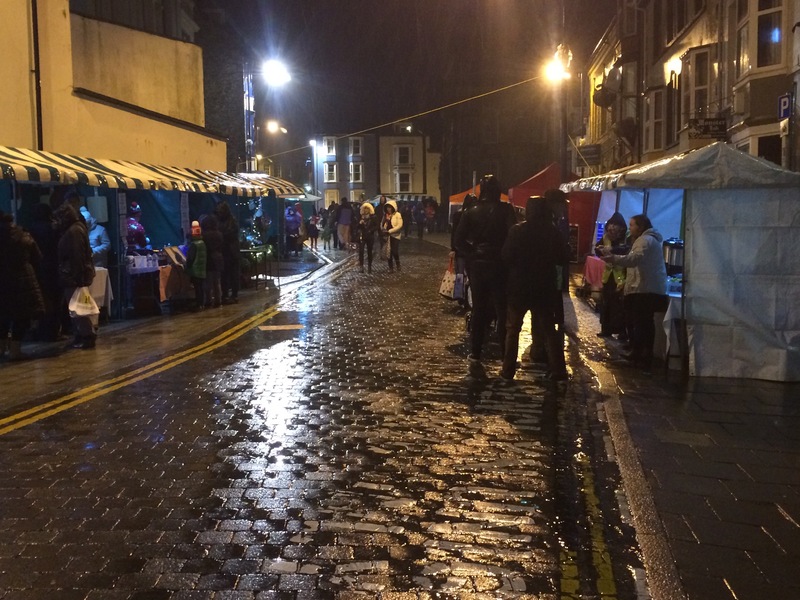 At 5pm the party was meant to be in full swing but the pouring rain meant the stalls didn’t have many customers and the choirs on the stage didn’t have many spectators. The big Christmas tree was being violently blown about and anything not tied down was soon flying about (including part of the stage covering). Fortunately, although the wind was getting stronger, the rain did eventually die off about 5 minutes before the lantern parade. 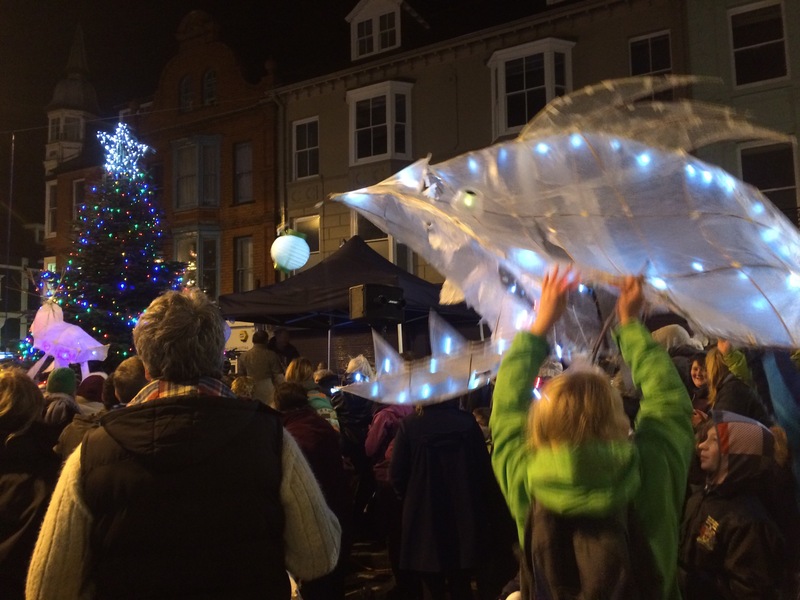 I partook of the free mulled wine and mince pies on offer and watched the children file past with their lanterns, accompanied by the Aberystwyth Brass Band. The Mayor switched the lights on (they didn’t know I was going to be in town) and then everyone (who could speak the local language) sang a few carols in Welsh. It had been a good day but the weather was deteriorating rapidly. I was supposed to be meeting up with Greg from my local pub to walk the next couple of days but unless the forecast was to change it was likely to be too dangerous to walk the exposed coastline safely. I had a whole day without waterproofs, albeit I got soaked when it rained in the afternoon. 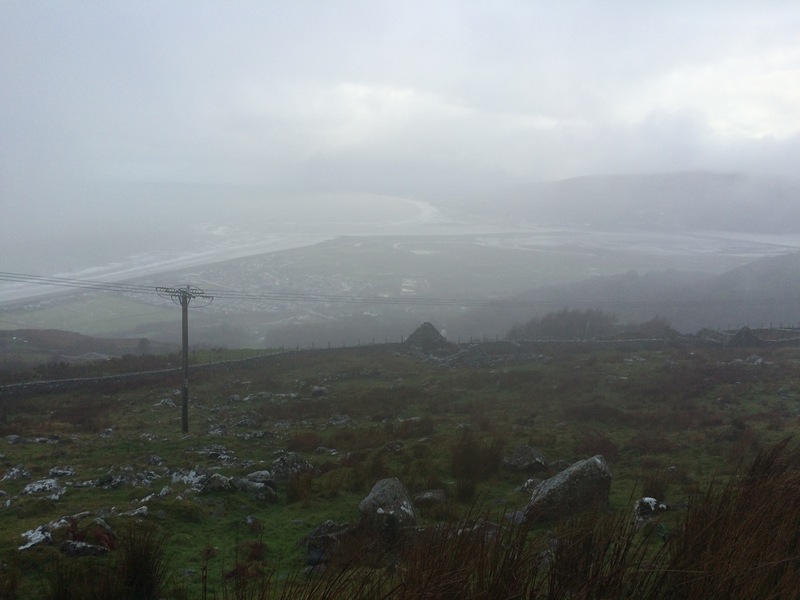 I walked straight up the steep hill behind Aberdovey and, despite the greyness, the views across the Afon Dyfi were great. In particular I could look directly along the very straight Afon Leri. The tide was high but receding and as I walked sandbanks were appearing in the estuary. 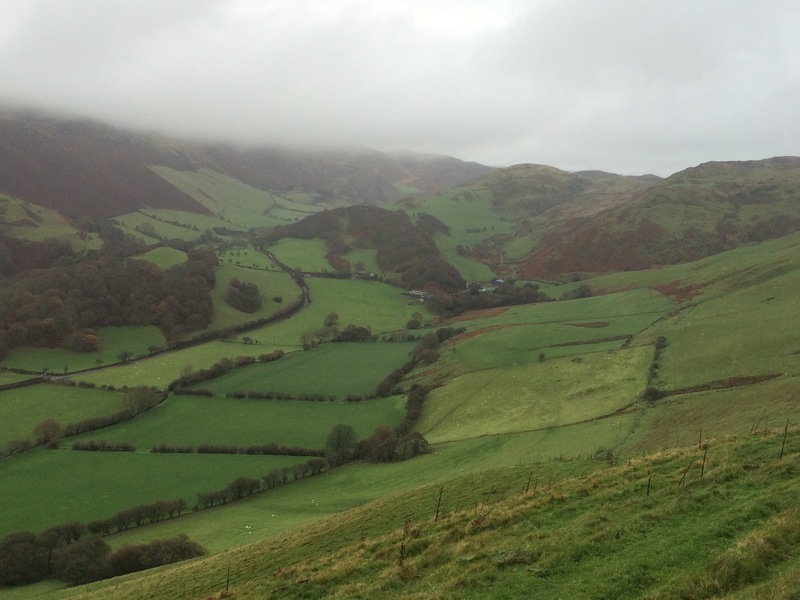 Today’s walk was over the hills bordering the Dyfi valley; I could have been a world away from the sea side. The beautiful hilly landscape had the same lumpy texture as NW Scotland, but with the addition of trees, bracken and sheep farms. I didn’t see another person all day. I passed through Pennal, a small village where there was once a Roman Fort (I only found this out afterwards as there was no indication in the village itself). 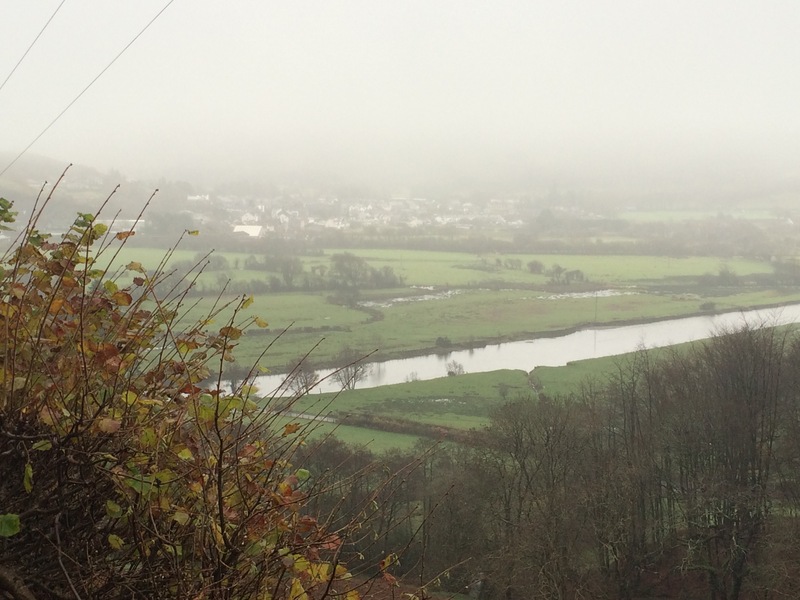 Not long after midday I was enveloped in a mist and fine drizzle. After that there were no views, just the ups and downs of the forest track. It wasn’t cold and I was sick of being cocooned inside my waterproofs so I left them off and just got steadily wetter. As I finally dropped back into the Dovey valley at Machynlleth I was able to see the expanse of the flat valley floor with the Afon Dfyi snaking through it. 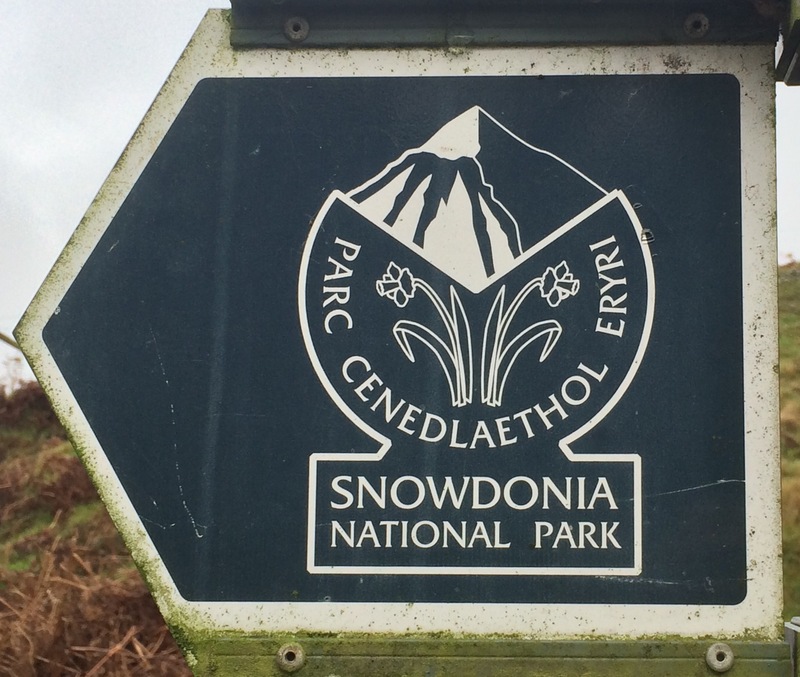 I walked the main A487 across the Dovey Bridge, noting its flood warning signs. The river looked fairly high but there didn’t look to be any danger of the bridge flooding (although I heard on the news that it did flood 3 days later). Crossing the River Dovey meant finally leaving the county (some might say Kingdom) of Gwynedd, which I have been walking around since I reached Bangor. 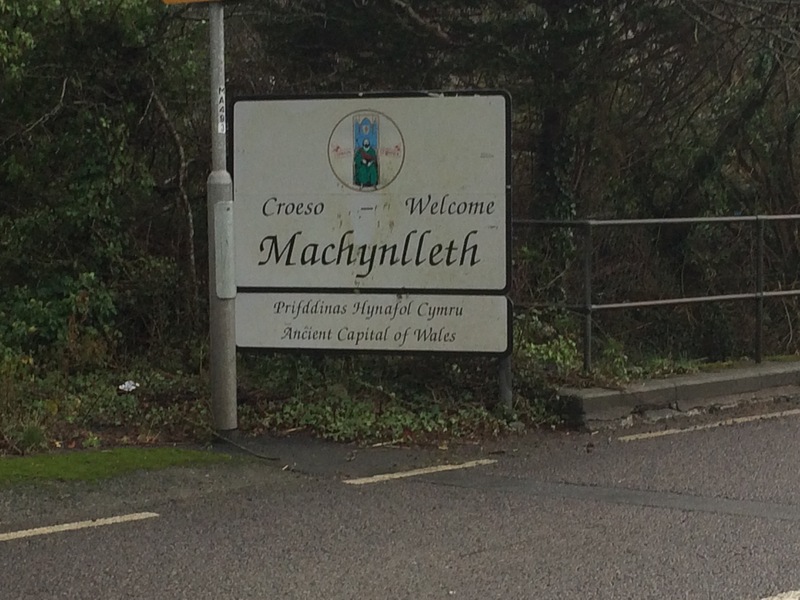 The market town of Machynlleth proclaims itself the Ancient Capital of Wales. 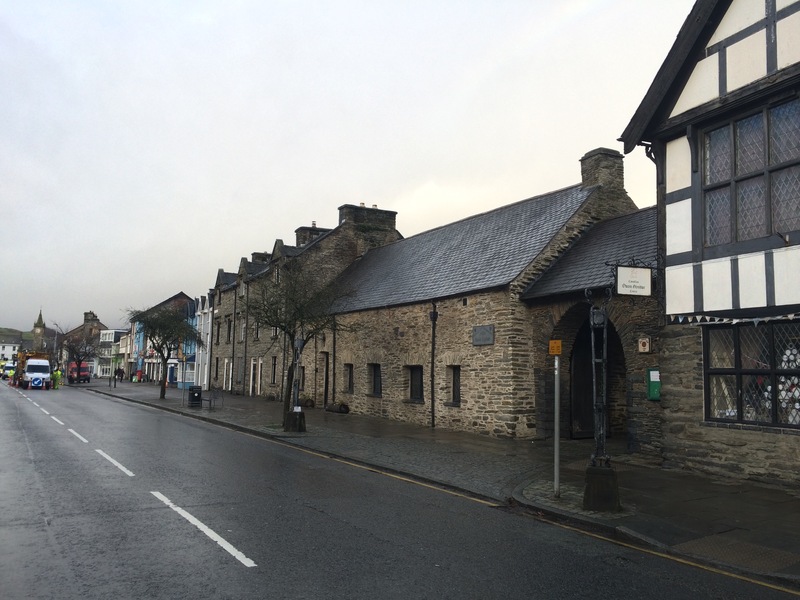 Although never officially recognised as a capital Machynlleth is where Owain Glyndŵr, who rebelled against the English, was crowned Prince of Wales in 1404. This grand event took place near the Parliament House, a mediaeval building that remains in the heart of the town. I wandered through the town, with its second hand book shops and its beautiful clock tower at the end of the high street. I sat in the window of the bakery with a coffee and a cake watching the world go by, and drying out. I spent my evening cleaning my boots and drying out my kit. 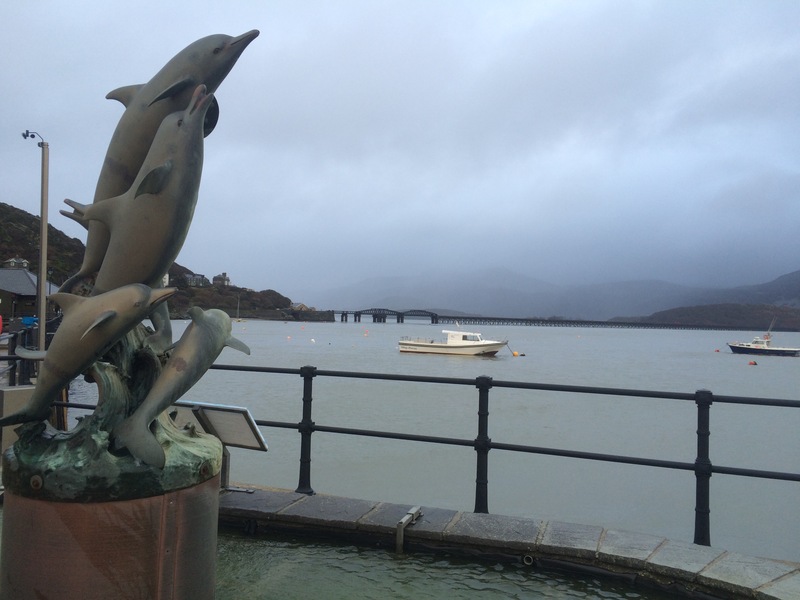 It took me 8 hours to get back to Barmouth yesterday; not that I minded as these days travelling is much more relaxing when one has time. I stayed in the same guest house as my last night here, Môr Wyn. 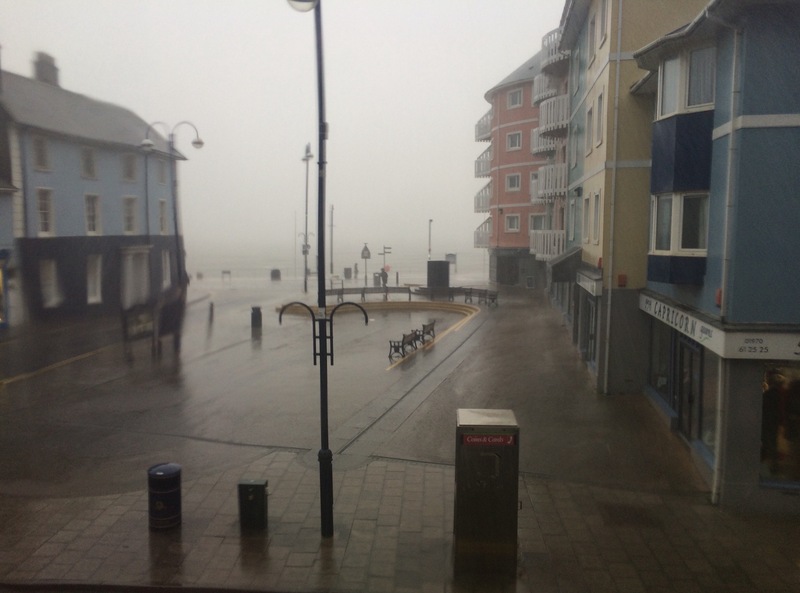 I asked Trevor if the storms had hit and he said a concrete slipway had been smashed and a huge tree had blown down. 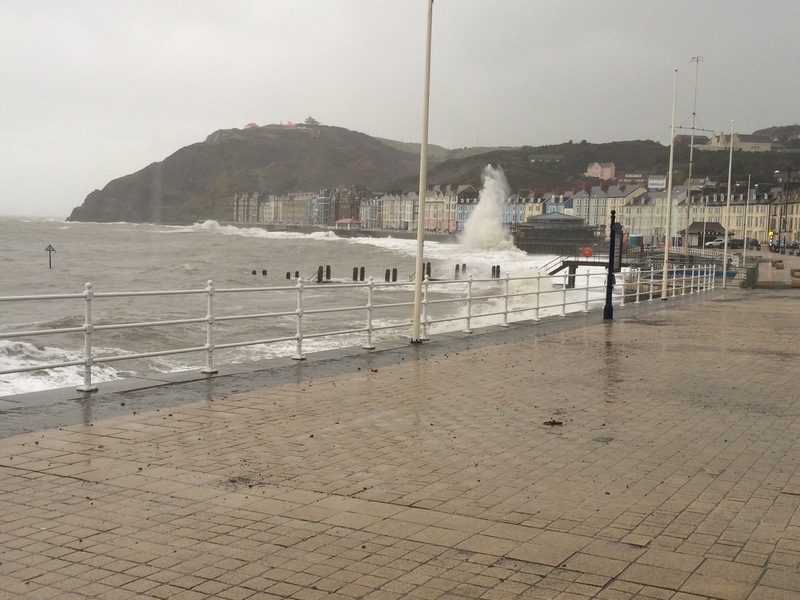 He reckoned it had been the windiest he’d experienced since he moved to Barmouth 10 years ago. I’m glad I hadn’t walked through that. It wasn’t raining when I left but within 15 minutes I was fully suited up and getting soaked. The toll booth for pedestrians using the railway bridge to cross the Afon Mawdach was closed so I didn’t have to pay 30p to get across. The wooden slatted bridge was very slippery. 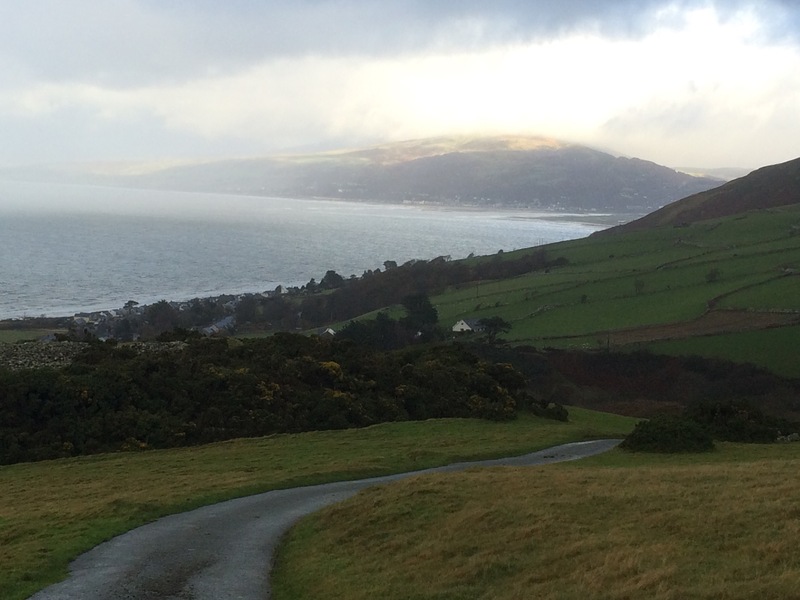 Despite the heavy rain I was able to enjoy the views back to Barmouth. 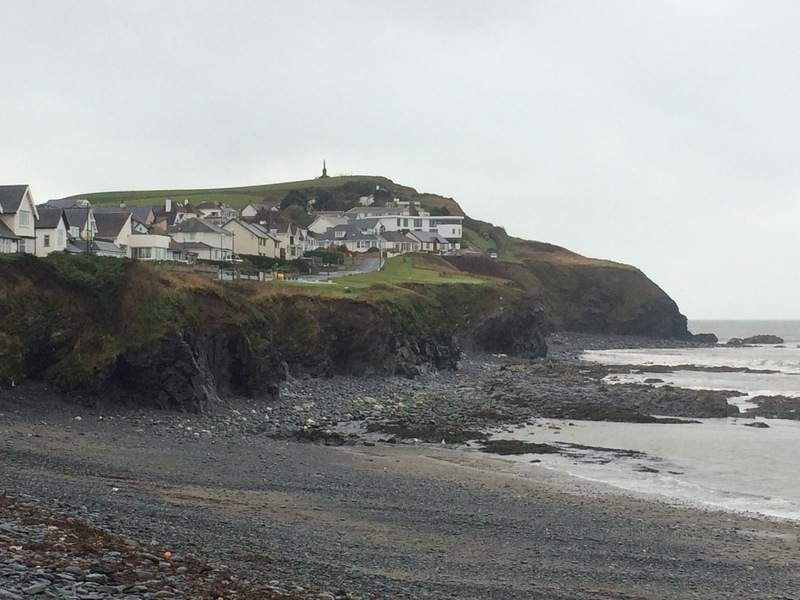 From the estuary the town looks small and neat, with slate houses tucked into the hillside. 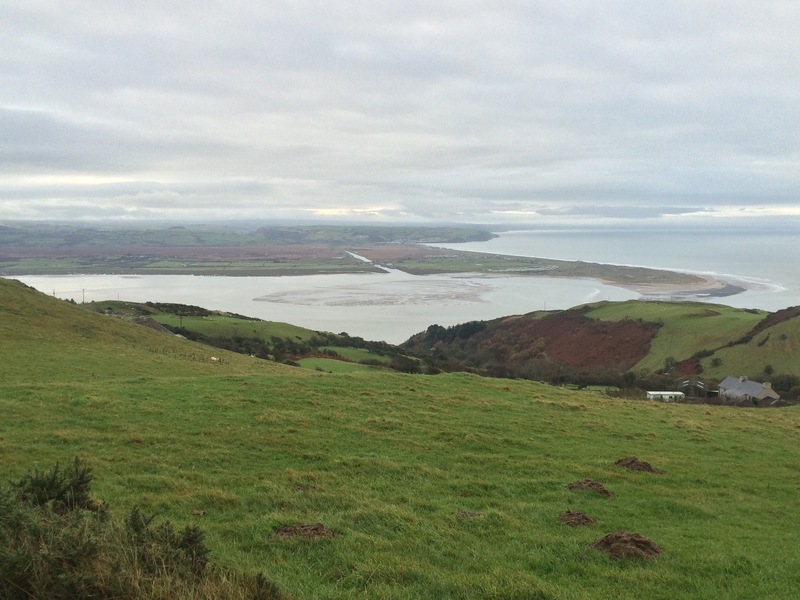 On the South side of the Afon Mawdach, Fairbourne sticks out further into the estuary than Barmouth. It looks like a bungalow town with a small gauge railway and is actually below sea level, protected by a large sea wall. I passed the RAF outdoor adventure centre – been there a couple of times before. From Fairbourne the coast path climbed up the hill and I had a great vista of the head of the Mawdach valley and could even see the Lleyn Peninsula when the clouds parted. 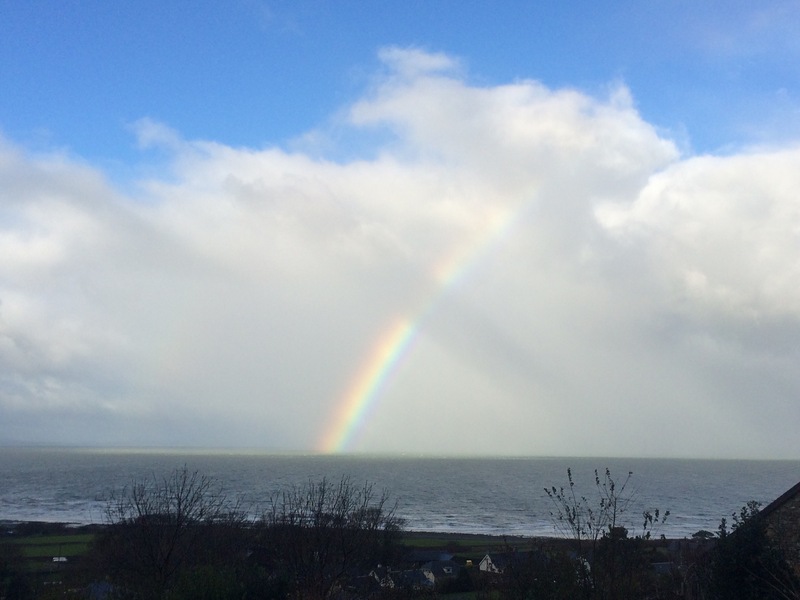 Belts of rain kept coming, interspersed by mizzle. 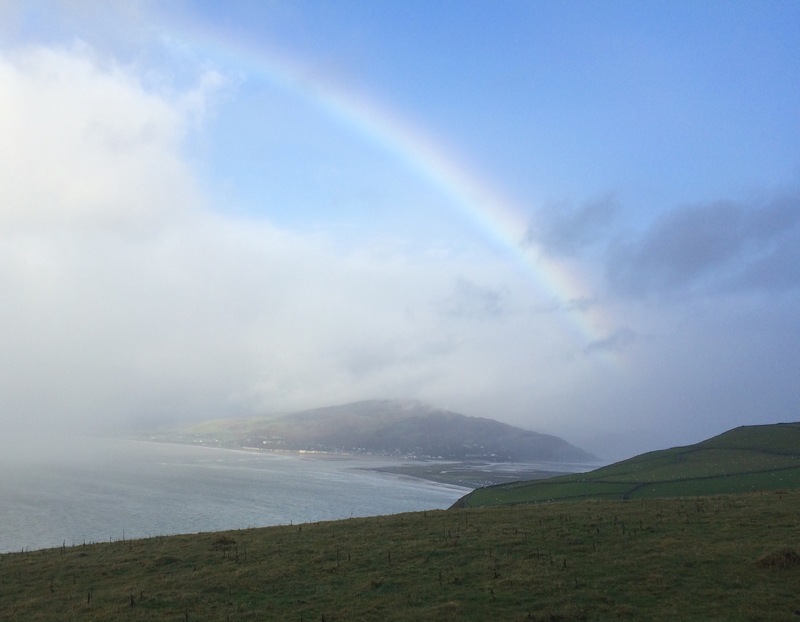 The ground was sodden and the views intermittent, but there were vivid colours and a couple of rainbows as compensation. 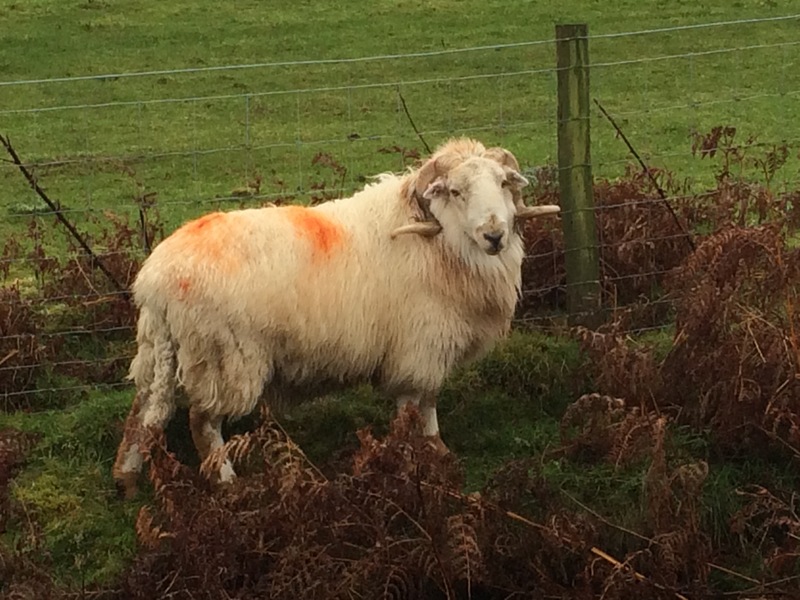 There was also peace and tranquility; just me and hundreds of sheep. 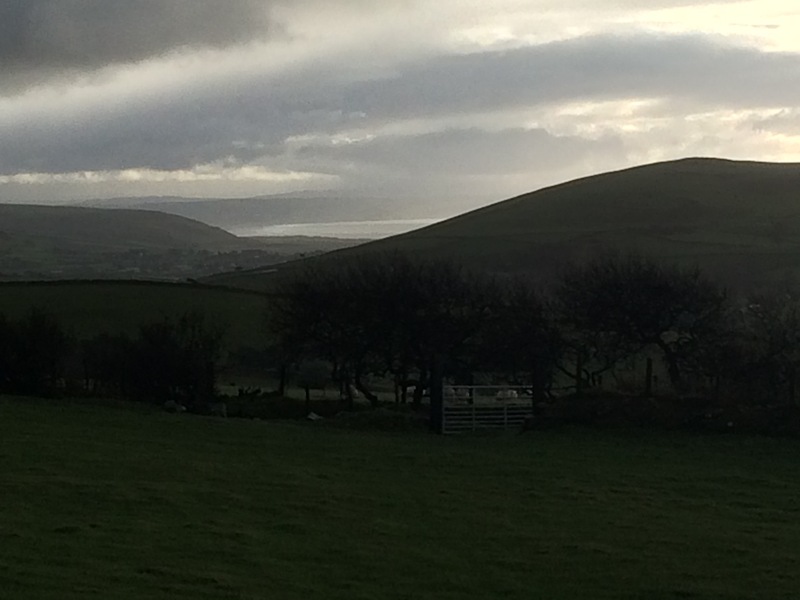 After about 3 miles I dropped off the top of the hill into Llwyngwril. Around here, all the settlements at the base of a hill have crystal clear, shallow rivers running through them. 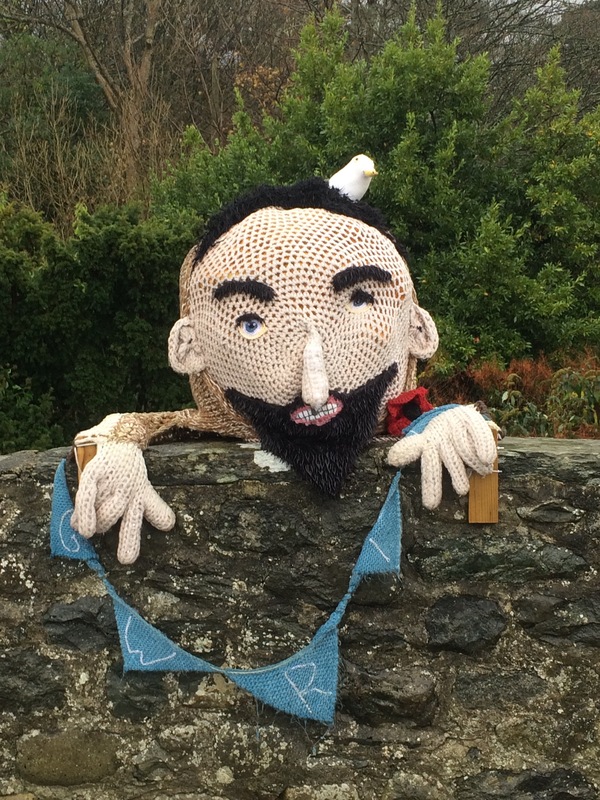 It looked like this village had its own graffiti knitter as Humpty Dumpty was climbing over the bridge. Is that a seagull on your head Humpty? 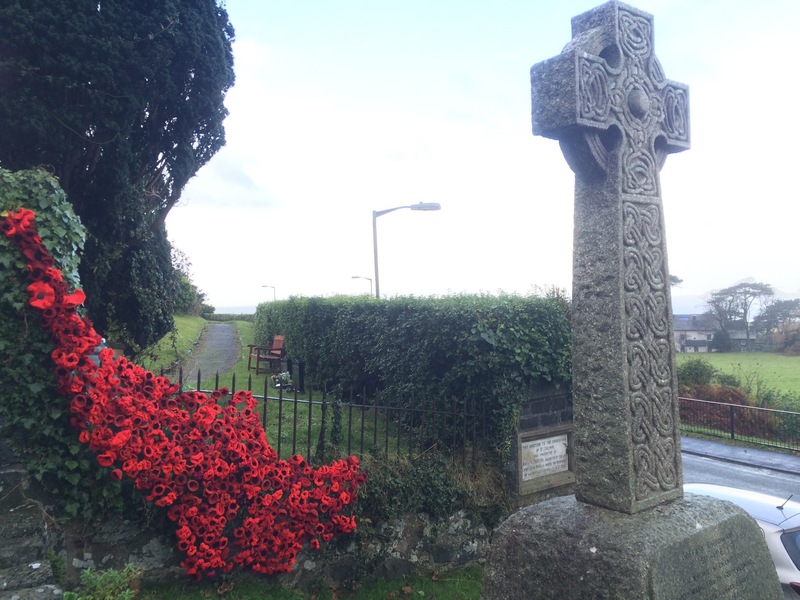 The war memorial was also decorated with scores of knitted poppies. Leaving Llwyngwril the path climbed up a hill again. 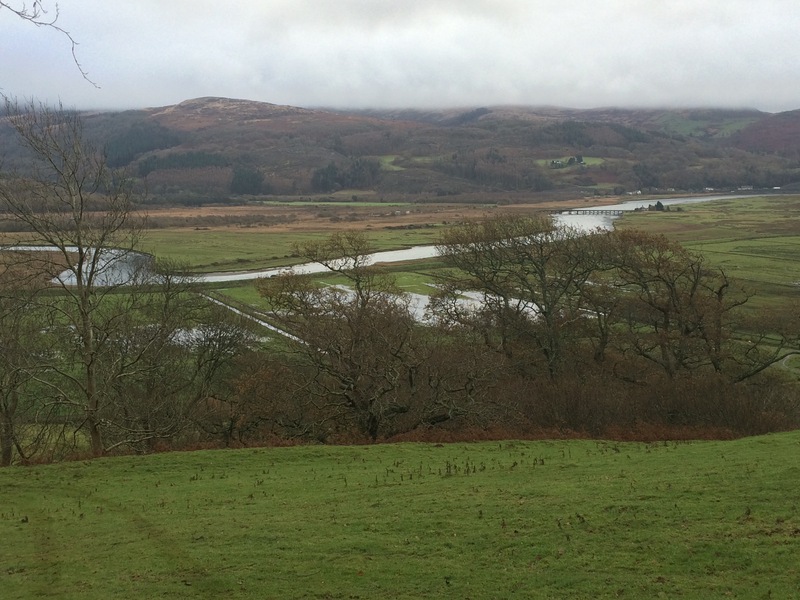 I got a glimpse of the entrance to the Afon Dyfi through the gloom before I dropped down a bit to skirt around a hill that once held a fort on top. Here the route became a bit more difficult to follow as I had to climb over and around 3 felled trees blocking the narrow path. Eventually I made it to a disused quarry and dropped down onto the road by the broad water, a large shallow bulge of the Afon Dysynni. Aberdovey was too far so I headed for Tonfanau train station (in the middle of nowhere, no settlement of any kind nearby). 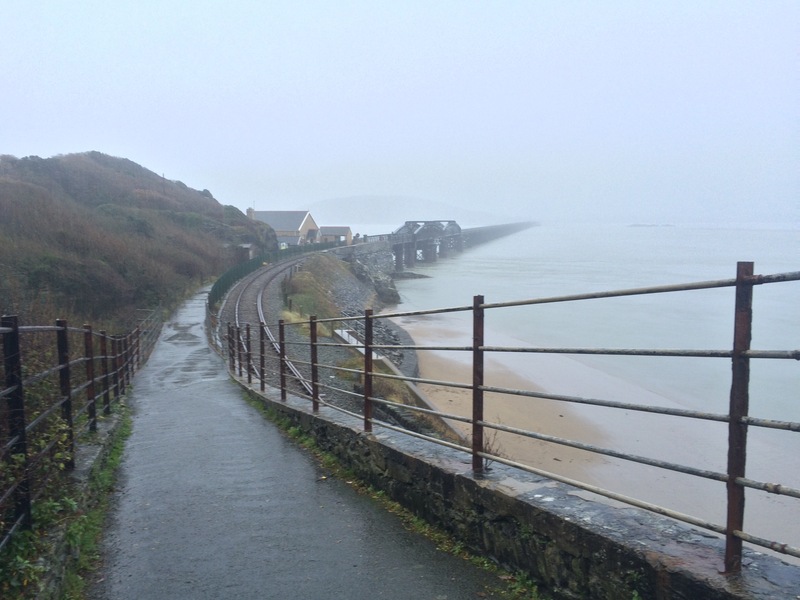 I caught the train through Tywyn and on to Aberdovey. 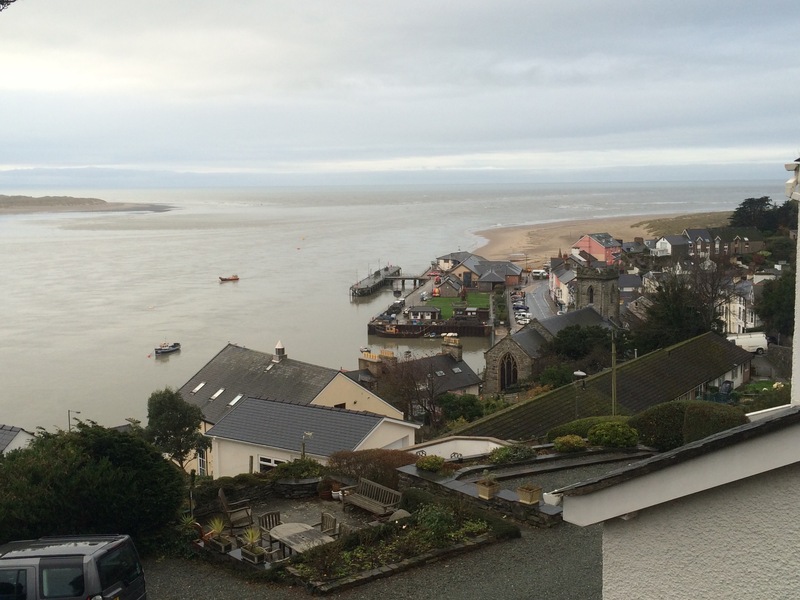 Aberdovey/Aberdyfi is right on the corner of the entrance to the River Dovey/Afon Dyfi. It looks like a nice little town and I was staying at the Dovey Inn, “the heart of the town”. My room overlooked the estuary and I was amused to see a bunch of kids paddling a raft they had clearly made as part of a military-style team building exercise (done that before!). 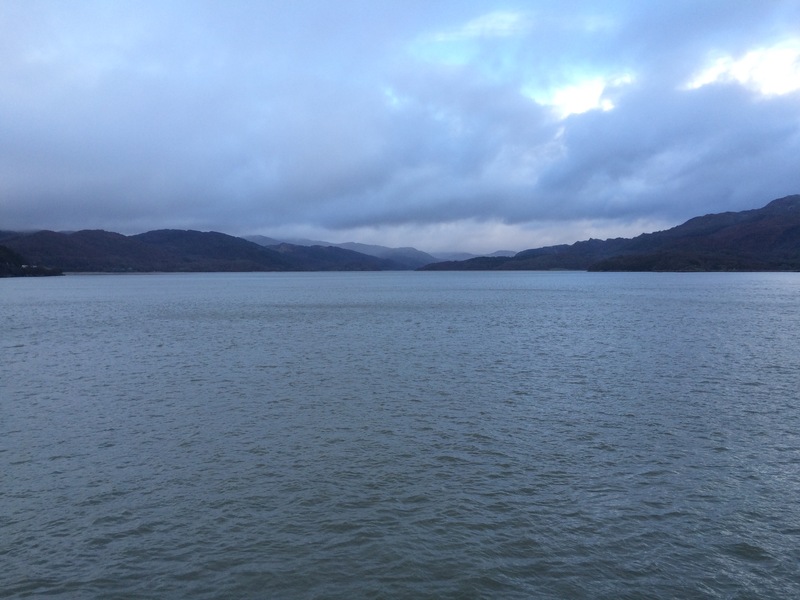 It was 4.20pm and nearly dark! It was a quiet evening in the pub and an early night.